Barefoot Fresca: Barefoot Running Better for Overweight Runners? I believe it 100%!!! It's a proven FACT the impact is far less. Wish more people would get that. I took up running six years ago, as as 51-year-old, 205-lb male. A good running shoe store put me into stability shoes, and then motion control shoes. No pair lasted more than 100 miles...because the structure of the shoe broke down under my weight, and I'd get new injuries. I went through at least a dozen pair of shoes that cost, on average, $90...until I decided to try racing flats--even though the shoe store warned me that these lighter shoes could cause injury. Just the opposite! I had far fewer injuries in the much lighter racing flats, and was able to reprogram my brain so I landed on the forefoot rather than the heel. Also, the racing flats lasted a lot longer than the heavy motion-control or stability shoes ever did. I am quite sure that running barefoot is better for THIS heavy runner than running in shoes...and that running in my Motion Control Shoes (which top the scales at 2.5 POUNDS for my size 14's) is a prescription for further injury. So...bottom line: I agree with you 100%. Running barefoot is an effective way to run in a LOW-IMPACT manner. And that of course is a good thing for any heavy runner. Ken, thanks for sharing that! It does seem to confirm the idea that barefoot is the way to go. I felt so light and graceful the first time I ran without my clunky running shoes. I use homemade mocs that keep my feet warm, yet allow me to feel the ground and naturally run with a correct form. No more knee pain, no more shin splints, and I feel like a kid again! I love this! My running is so quiet I was able to sneak up on a bunny...felt a little like an American Indian. Being wiry dude, I think many people attribute my adeptness at tomfootery to the lack of force with which gravity pulls me to the ground. I think such an attribute could be an obstacle in the learning process. If I can land harder without pain as a result of my lightness, I'm more likely to have bad habits with effects not felt immediately. I think anyone who is concerned about larger people running barefoot doesn't understand or doesn't believe the basic concept of running barefoot: it's about learning how to be gentle. Every runner stands to benefit if they learn to run more gently. You are so right on the money, BFJ! Being heavier there has been just no room for error. It's either gentle or no go with the barefoot. It builds a lot of a certain kind of strength to run gently while bearing more weight. If anyone wants to feel it, they can just load up a fifty pound back pack and try to run gently with it on. It won't be exactly the same, because, for example, with me a lot of the weight is in my legs and not on my back, so it's loaded differently. But carrying a heavy backpack might give a person a little bit of an idea of the task. Came back here to state something a little bit different (clearer?) way. Dunno' if you'll see this, BFJ, but I think what it means is that what overweight runners need to do is to run gently. They do better when they learn to run gently because it is less stressful to run gently. Barefoot running teaches someone to run gently. Remember too that most people assume the foot is an imperfect mechanism at best. Extra weight on these not-fully-evolved appendages can only stress them further. It's not just about shoes. Barefoot running challenges much of what is taken for granted. Your reasoning seems sound to me :) Its like when people ask about what will support my arch if I don't have shoes. They don't know the nature of an arch in the same way that they associate pounding the ground instead of running gently like you talked about above. Lovely post! Keep at it! 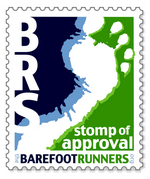 This is intriguing to me as I'm considering restarting to doing barefoot or minimal running this spring. I think your approach has been great so far!